One of the landmark of Hollywood Boulevard is the world famous Grauman's Chinese Theatre that treats 4 million visitors a year to the magic and majesty of Hollywood. 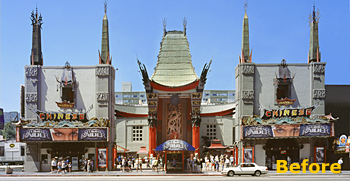 On November 9, 2001 the legendary Grauman's Chinese Theatre officially reopened to show off it's $7 million facelift and unveil the addition of the brand new Mann Chinese 6 theatre complex. Grauman's Chinese Theatre was built in 1927. This historical Hollywood building has undergone minor renovations in previous years, but this is the first time in its 75-year history that major changes have been made. Ironically, those changes have restored the building to its original 1927 appearance. FAMOUS FOOTPRINTS - There are numerous stories of how the original notion for footprints in the courtyard started. One of the most widely known tales states that silent screen actress, Norma Talmadge, accidentally stepped into a sidewalk of wet cement while visiting the construction site of the Chinese Theatre and Sid Grauman was seized by a brilliant idea. This was the beginning of the legendary footprinted forecourt, which is still seen by millions of visitors each year. More than 240 personalities have been immortalized in the Forecourt of the Stars since 1927. * More than 240 personalities have been immortalized in the Forecourt of the Stars since 1927. * Some actors and actresses placed their left hand and/or footprints only, while some imprinted their infamous trademarks: Betty Grable's leg, Jimmy Durante's nose, and the big fist of John Wayne. 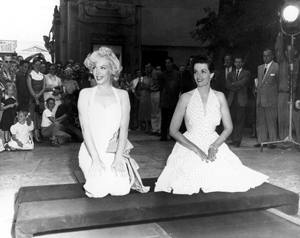 * The two most popular squares in the famous courtyard are those belonging to Marilyn Monroe and John Wayne. * Billions of visitors have held their hands and feet up to the various squares in the courtyard hoping for a perfect fit. MORE INFORMATION: Official website: http://www.manntheatres.com. All characters and related indications are © and TM of their respective owners.